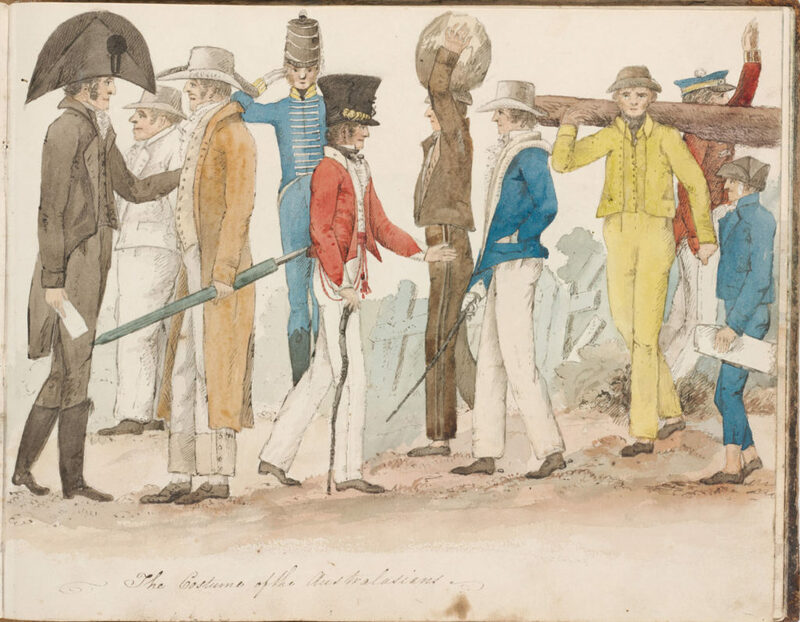 This scene depicts colonial men of various types as seen by the artist on the streets of Sydney in about 1817. It shows the different strata of colonial Sydney society – civil and military officers, free settlers, soldiers, emancipists and serving convicts – in an apparent easy co-existence. 3. an ‘exclusive’ or free settler carrying a large green umbrella and wearing a wide-brimmed hat (perhaps made locally of cabbage tree palm) with a long, brown ‘duster’ coat over a buff-coloured waistcoat with a stand collar, and a white linen shirt with a pleated, frilled front and a pointed collar, above wide-legged white [moleskin] trousers with buff-coloured, deep, side-buttoning cuffs and brown shoes buckled over the instep. NB: Large green umbrellas, probably imported from India, were regularly listed in the sales advertisements of Sydney retailers at this time. 6. a government convict (perhaps privately assigned) carrying a large burden on his head and wearing the standard issue leather cap with a brown ‘slop’ suit, brown leather shoes and no stockings. 9. another soldier, his hand raised in greeting, wears a blue cap with a black peak, trimmed with a white pop-pom and a gold cap band, with a double-breasted, braided, long-tailed red wool coat and white trousers. This drawing is a primary source for the history of clothing in Australia. Distinctive in its social inclusiveness, and its tone of amiable satire, it includes rare images of convicts and provides a splendid record of how class and status in a penal colony were instantly recognisable by dress. Edward Close (1790-1866), soldier, engineer, settler, magistrate and member of the Legislative Council, arrived in New South Wales in 1817. Following colonial service as engineer at Newcastle, NSW, Close resigned his commission and was granted land at Morpeth on the Hunter River. Close would have recieved some training in topographical rendering during his training as a military officer; his coastal and landscape watercolours are the most convincing of his drawings. Lacking academic training, he was naturally less successful with anatomy which explains the naiveté of the figure compositions in this image, but this is more than made up for by his careful observation of the social and clothing codes in operation around him on his arrival in the colony. Edward Charles Close (1790-1866) attrib.